Six months removed from a raucous election that ended in an unexpected result former President Obama has continued his tirade against all things Trump, pitting himself against the Commander-in-Chief if increasingly volatile and shallow attacks. One of his favorite digs at The Donald stems from his own open-border beliefs and globalist agenda, railing hard against the President’s proposed border wall. Now, as Trump visit the Middle East and Europe, Obama has touched down in Germany in an extremely transparent attempt to insult POTUS. 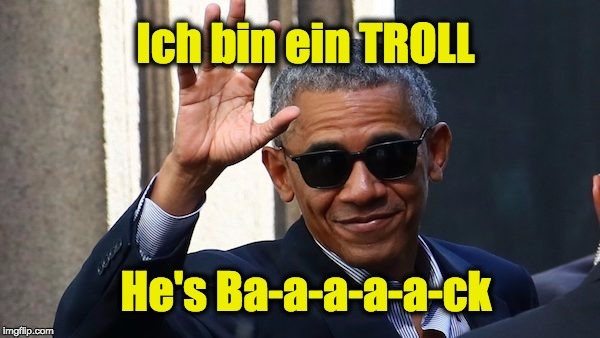 “Speaking in Berlin on Thursday, Barack Obama pushed for continued globalism and heaped praise on German Chancellor Angela Merkel. “’There’s a competing narrative of fear and xenophobia and nationalism and intolerance and anti-democratic trends,’ said Obama, discussing democracy and global responsibility with the chancellor, at the biennial congress of the German Protestant Church. “’In this new world we live in, we can’t isolate ourselves. We can’t hide behind a wall,’ Obama declared from the Brandenburg Gate, as police helicopters patrolled the skies and snipers watched the scene from nearby rooftops. Obama’s remarks are particularly poorly-timed, as Europe’s immigrant terror crisis continues to plague the continent and in Saudi Arabia president Obama united the Sunni Muslim into a coalition to fight terror. Something Obama was unable to do because of his pivot from our traditional Sunni Muslim allies toward Iran. Just this week Salman Abedi, the son of Libyan refugees, returned to Great Britain after a prolonged visit to Libya. He re-entered the UK just days before committing an unfathomable act of radical Islamic terror at Manchester Arena, in which his suicide bomb, filled with nails and bolts, killed over 20 innocent young women and injured over 100 more. His jihadist targeting of western culture was apparent. The concert that Abedi chose to attack was that of American pop star Ariana Grande, whose primary fan demographic is composed of pre-teen women – a reprehensible choice, even by ISIS standards. Still, in the wake of this most heinous attack, liberals such as Obama and Grande’s fellow pop star Katy Perry have continued to call for open borders and the dissolution of national sovereignty in favor of rampant and dangerous globalism.